WEST WARWICK, R.I.--(BUSINESS WIRE)-- AstroNova, Inc. (NASDAQ: ALOT), a global leader in data visualization technologies, today announced that its Product Identification group has launched the QuickLabel® QL-300, the world’s first 5-color, toner-based tabletop printer designed specifically for production label printing. The QL-300 goes beyond the traditional 4-color (cyan, magenta, yellow and black) printing process by adding white toner, giving customers the ability to print white and CMYK in 1200 dpi (dots per inch) high resolution in a single pass. The benefit of toner EP (electrophotographic) technology includes label print that is durable, water-fast and UV resistant. 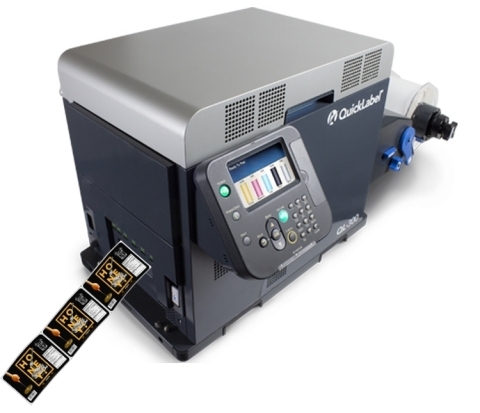 The QL-300 expands printing labels from traditional white or light-colored materials to also include transparent/clear, black, Kraft paper, metallic silver and gold colored label materials. The AstroNova Materials Research Lab has tested and approved a wide variety of label materials, from economical to premium, that are compatible with this printer. The addition of white toner expands the creative labeling opportunities for industries such as personal care, cosmetics, food and beverage, beer and wine, chemical, e-liquids and many others. QuickLabel’s newest printing solution will be unveiled at WestPack, which takes place today through Thursday at the Anaheim Convention Center. Visitors to the AstroNova booth (#5439) will be able to view live demos of the QL-300 along with the expansive product lineup from both the QuickLabel and TrojanLabel AstroNova business units. The QL-300 prints label widths ranging from 1.0” to 5.0” and features roll-to-cut or roll-to-roll operation. With a built-in automatic cutter that allows for single-pass printing, label waste is eliminated. The QL-300 also includes a free license to CQL Pro, QuickLabel’s advanced labeling software that allows users to effortlessly design, manage and print their own labels. To see the QL-300 in action, visit https://www.youtube.com/watch?v=mK2Ywnm_OTg.